The Hidden Valley Eagles have the championship in sight—but will chicken pox get in the way? The Hidden Valley Eagles are on track to make the playoffs. Full of focus and determination, every player is at his best, and the team is working better together than ever before. But when a bout of chicken pox threatens to overtake the team, will their playoff dreams disappear? Tiki and Ronde and the team are ready for the playoffs. They have 3 or 4 games until they make the State Championship. The guys are nervous that chicken pox will affect the team as it has been going around the school. The twins end up contracting chicken pox which side lines Tiki for a game. Fortunately both brothers play the State Championship and if they win this will be their second win! This book was great because the boys played proud and they never gave up. 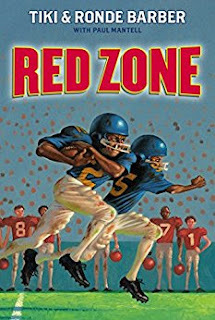 Kids will love this book because Tiki and Ronde make reading interesting, fun, and entertaining. I have been reading this series nonstop. I love Football and as the twin's mom says, "Play proud and never give up".